How many times have we walked down the street, or taken the subway, only to go “Oh dear, that person is wearing the same top/carrying the same bag/kicking the same pumps as I am”? If so, you’re probably just becoming cognizant of the incredibly bland sameness inflicted on us by the world of crass commercialism and its one-size-fits-all approach to providing products and services for consumers. But there’s hope – an entire barrage of new businesses are springing up in response to combat that boring mass approach by embracing customization. 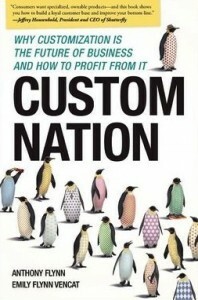 In fact, customization is set to redefine the world of business such that even large companies have been hopping onto the customization bandwagon, argue the authors of “Custom Nation: Why Customization Is the Future of Business and How to Profit From It“. Entrepreneur Anthony Flynn and business journalist Emily Flynn Vencat explain in the book that adopting customization can help companies of any size and industry can adopt customization of various levels reinvigorate their businesses and thus drive profitable growth. Flynn should know – the YouBar founder started a line of custom protein bars at home in 2006 to meet the taste, health and allergy needs of customers and has seen business grow manifold since. He shares how his own experience with customization – as well as the success stories of various companies specializing in customization (especially the CIY or “Customize It Yourself” segment) such as Zazzle, Shutterfly, CafePress and Pandora – and how that disrupts the industries they’re in. But aside from simply sharing the gospel of customization, Flynn and Vencat actually provide a practical how-to guide that advises businesses big and small how they can incorporate customization to make their products stand out and sell. They share various crucial “lessons” on customizing – competing with mass producers in speed, quality and price; providing exceptional customer service, listening to your customers etc – and even argue for the need to customize marketing methods to fit the product or service. If you’re a small business owner or an aspiring entrepreneur hoping to disrupt the market you’re in using customization, “Custom Nation” gives you a great insight on how customer needs have changed and how you can give customers what they want. There’s even a very useful resource on the Custom Nation website called “Company Customizer” that tells you the custom companies operating in a wide variety of industries and across countries as well (in case you’re looking to compete there or understand who’s about to disrupt you). Or you can ignore this new reality and become irrelevant in the marketplace. Your call.